Whether you're watching a movie in your home theater or listening to the sweet sounds of your outdoor speakers, these accessories may be able to enhance your sound and provide the additional support you need for effective installation. Our ceiling and in-wall speaker brackets are not required when you purchase OSD Audio speakers since they all include dog-eared clamp mounting systems. However, these brackets still offer a number of advantages in certain situations. 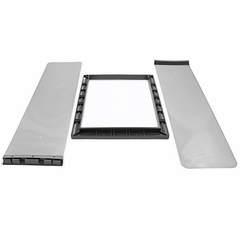 For instance, they offer additional support of the wall or the ceiling by creating a stable base for your speaker. Meanwhile, they provide a template for cutting a mounting hole so that you can achieve precise placement down to a fraction of an inch. With our in-wall and ceiling speaker boxes, you'll be able to enhance your speaker's performance without spending a ton of money. These affordable metal back boxes provide the ideal air volume for the speaker. It also acts like a sound chamber by directing all the sound outwards and insulating against sound that would otherwise potentially travel to other rooms or floors. If you have in-wall speakers facing outside on a wall between your patio and kitchen, for example, the ideal in-wall speaker box construction would ensure that your music travels outside rather than in towards the house. 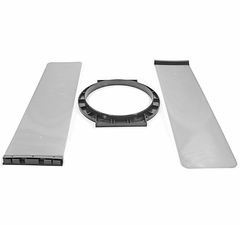 Find the perfect accessories for your in-wall and ceiling speakers at Outdoor Speaker Depot. We'll help you make sure your indoor and outdoor audio systems produce the best sound possible. We offer helpful instructions for installation, and you can always contact us to take advantage of the free lifetime technical support you'll receive with every purchase.